Any Road to Hana tips on how to make the most of my experience on the R2H? 1 Rent a Jeep Wrangler. There is no better way to experience the canopied rainforest, winding roads, and rugged terrain. This is one of the most important Road to Hana tips! Do not neglect this one if at all possible. 2 Make sure your rental vehicle has a CD player &/or Aux Audio Input. The R2H Audio Guide comes in both physical & digital formats. When renting your vehicle, request one with either a CD player (for physical guide) or an Aux Audio input (for the Digital Guide). For the Digital Guide, you'll want to bring along an 3.5mm Aux Audio Cable. And if you're using Apple's new iPhone 7 or 7+, be sure to bring your Lightning-to-Audio adapter! 3 Begin before 7 a.m. in Paia. There is so much to see, plus you’ll beat the crowds. Grab breakfast before you go at Charley's or Paia Bay Coffee in downtown Paia. Both have excellent service and their food is superb. 4 Fill up your gas tank before you go. The next filling station is in Hana Town! Allow locals and lines of cars to pass. 6 Slow down. Take your time. This is not a race. There is no finish line. The only prize you'll receive is the sights you see and the memories you make. 7 Plan to spend at least one full day on the Road to Hana. We recommend two or more days. This will be your favorite part of Maui. This is the Hawaii you've grown up dreaming about. 8 Stay AT LEAST 1 or 2 nights in Hana. We recommend staying your ENTIRE vacation in Hana if you want to get away from the hustle and bustle and experience true paradise. This is the REAL Hawaii. Our favorite hotel is in Hana. It was rated the #1 resort in all of Hawaii! This is the best hotel on Maui. Find out why. 9 Drive the full loop. Don't listen to the naysayers. If you do, you'll miss out on some of Maui’s greatest visual treasures. Other guides and reviews will recommend you turn around after Hana. But there is so much more to see! Two of our favorite sites in Maui are beyond Hana town. Many will steer you away from this because of danger. The back side of the loop is a little bumpy from years of patching the road, but it's paved and completely safe. The only thing you will need to be sure to check is whether your rental car agency has any restrictions. 10 Support the local restaurants and food stands. Other guides and reviews will tell you there is no lunch until Hana. 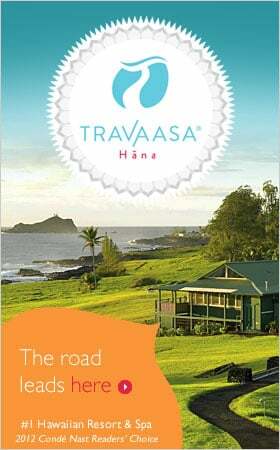 Our Road to Hana CD details all of the great local places to eat from Paia to Hana and beyond. Again, you will miss out on many delightful treats if you choose not to stop and support the locals. TIP: Aunty Sandy's, Coconut Glen's ice cream, & Braddah Huts in Hāna are some of our favorite spots! 11 Begin the journey prepared. Below is a list of items that will help you maximize your experience. What items should I take with me on the Road to Hana? And for the ultimate experience, get your copy of our Road to Hana CD, which includes and an audio tour of the Road to Hana, more Road to Hana tips, the top 15 stops on the R2H, a large Road to Hana map, and itineraries for the Road to Hana.